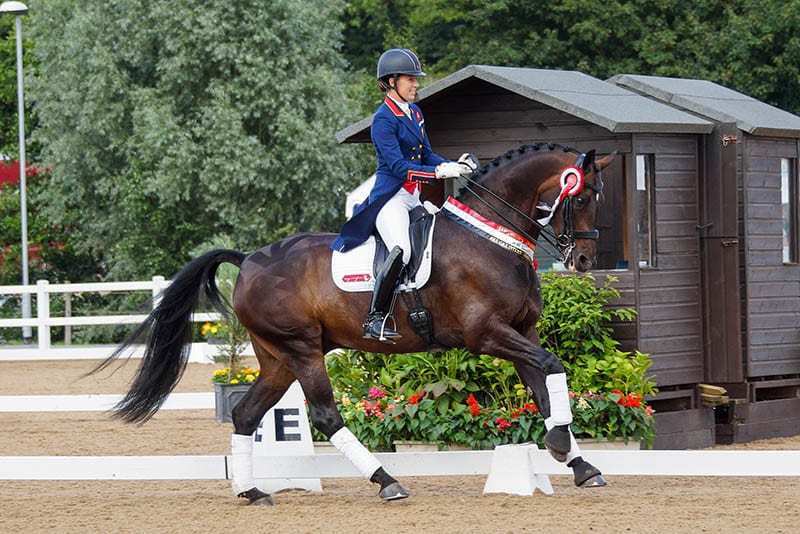 Charlotte Dujardin continues her winning streak as she claims top spot in all three classes she competed in on day four of Hartpury’s Festival of Dressage. The day’s Gala Evening event is still to come. 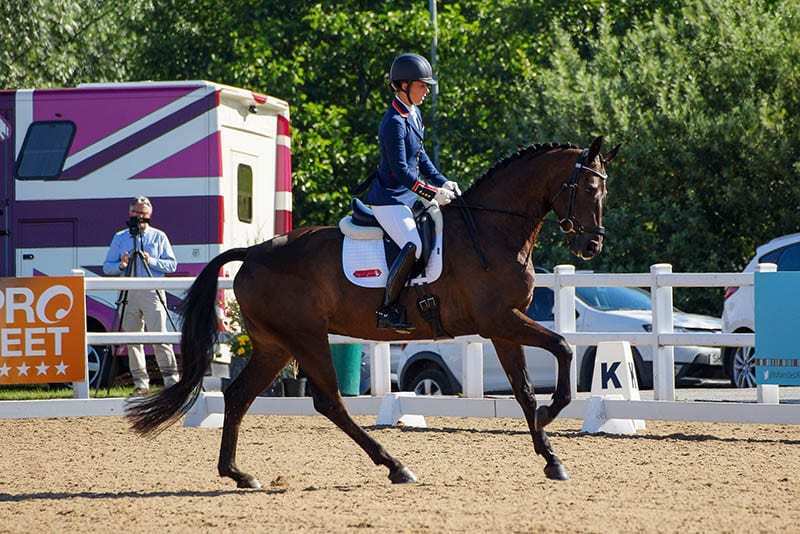 In an eventful last class of the day, which saw the Red Arrows fly overhead mid-test for Britain’s Levi Hunt, Charlotte claimed the top spot on Carl Hester’s Hawtins Delicato with 75.263%. 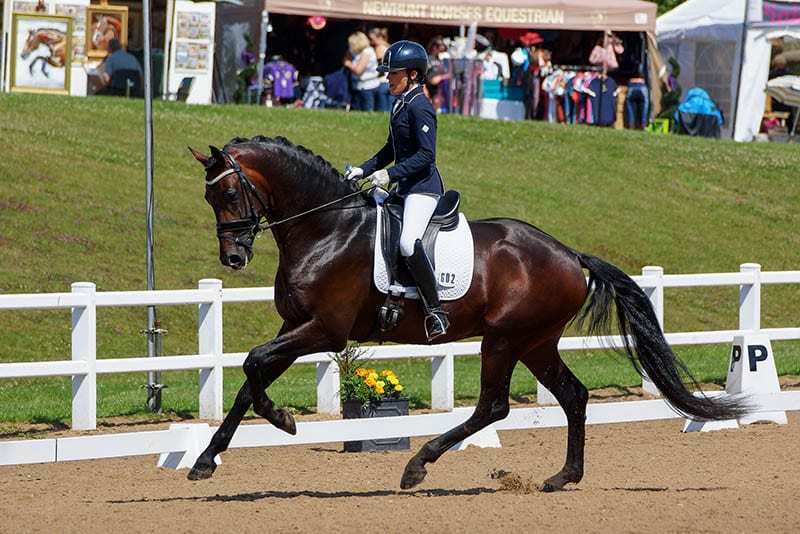 Britain also took the second spot in the Hartpury Sport FEI CDI Intermediate I with Lara Butler and Kristjan on 73.289%, ahead of Denmark’s Sune Hansen, in third place, riding Chass on a score of 70.737%. After producing a lovely test, of which Carl Hester said, “he was much more relaxed today, a mistake-free test and I am very pleased with his performance,” Hawtins Delicato decided to keep the crowds entertained with some airs above the ground in the prize giving. The action indoors this afternoon saw Kate Cowell storm away to win the JS Teamwear Advanced Medium 98 on Dramatic Conquest with 76.05%. Charlie Hutton rode Hawtins Rossana to a score of 72.76% for second place whilst Zoe Sleigh and Francisco were hot on their heels to complete the top three on 72.50%. With qualifying places going to the top five from each class, there was hot competition in the Shearwater Insurance Semi Final ages classes this morning. Dujardin clinched the top spots in two of them, taking the first and second place in the 6 Year Old class as she rode Mount St John VIP to first place on 8.60 and Gio into second on 8.44. Tim Heappey completed the top three on Tantoni Dallaglio with 8.06. Riding hers and Carl Hester’s Hawtins San Floriana into the lead with 8.68, Dujardin also claimed first place in the 5 Year Old class, ahead of Jessica Dun and Helga on 8.36. Amy Woodhead was close on her heels for third with a mark of 8.32 aboard Mount St Kohn Zonetta. The 4 Year Old Shearwater Semi Final was a close-run affair, resulting in a win for Kerry Mackin and Izonik with a mark of 8.60. Just behind was Santo Del Ponca ridden by Daniel Sheriff for 8.22 whilst Ashley Jenkins steered India to third on 8.08.